It's solidly on there. I'm not sure what it would rip off. It's getting taken off though. Don't want to find out. Just ordered my second one of these. I had to sell the first one due to the gussets interfering with my swaybar. Looking forward to reinstalling along with a strut bar. 30% for a few days guys! It does hang a bit low, I always scrape speedbumps. All. The. Time. I've got one on my convertible now, I consider it a must have as it definitely reduces the scuttle/cowl shake around 50-60mph. That said, I am at stock height, so ground clearance is not a factor that I really have to consider. installed on my vert as well. incredible. Looking at your front on shot there, I'd be concerned with how low the x-brace hangs. 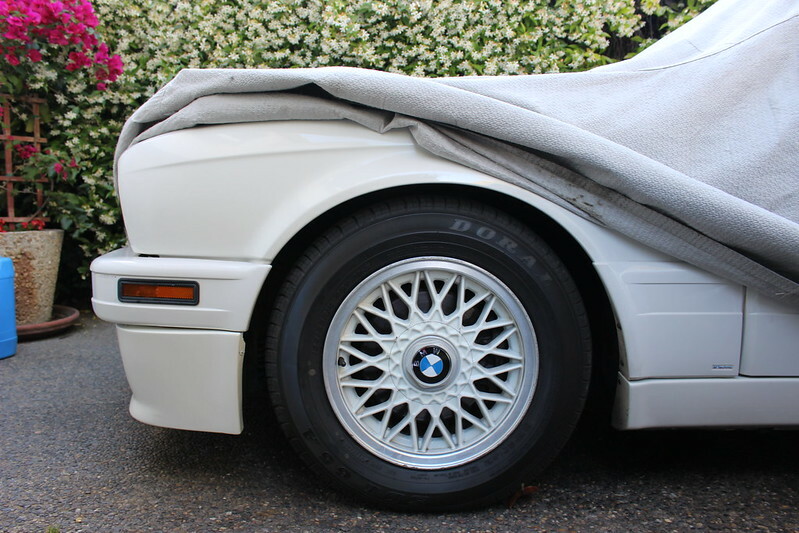 The e30 sump is already vulnerable in lowered cars, and it looks a good inch lower than the sump? I bought one of these and when I saw this during installation I didn't even bother finishing putting it on. My car already bottoms out enough as it is. If your used to driving lowered cars it isn't horrible, but be cautious of high spots on pavement. If you see a high spot on the road just drive around it, don't try and be a hero by centering your car perfectly thinking you won't feel anything cause you will when your oil pan or X brace strikes the debris on street. That's how you break oil pans. It's always in the back of my mind while driving, I'm running Ground Control coilovers. Edit; Few pics. 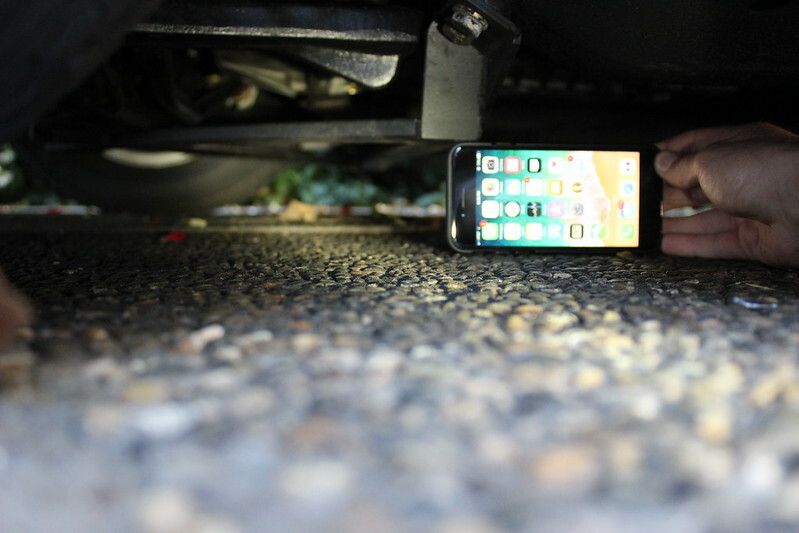 Here's a iPhone 7 on it's side and a pic of my ride height. The X Brace is somewhat parallel with your front wheels, so in other words when your moving slowly over a speed bump, as soon as the front wheels start to travel up/over the speed bump, your X Brace also travels upward and away from the bump. The issue is when you don't go over the bump with your front wheels and try and center the car so the front/rear wheels avoid the bump completely. The brace hang's low enough to which you might scrape. Hope you guys get what I'm saying. Lastly, I'm not using the spacers pictured on page 2, second pic "Haystack" posted. They're optional and if removed bring the X Brace up about half a inch. I also used all the factory hardware cause mine wasn't included with any. Last edited by KIRIEIW; 06-13-2018 at 07:04 PM. Stock front swa bar? I have a thicker UUC front sway and without the spacers it was a bit too close for my liking. Yup just a stock convertible sway bar here, I can see why you had to use the spacers then. Here's my review of the recent brace purchase. I ordered during their sale a monthish ago and I guess they got a ton of orders because I didn't get my brace for just shy of a month. They did answer questions quickly and professionally though. 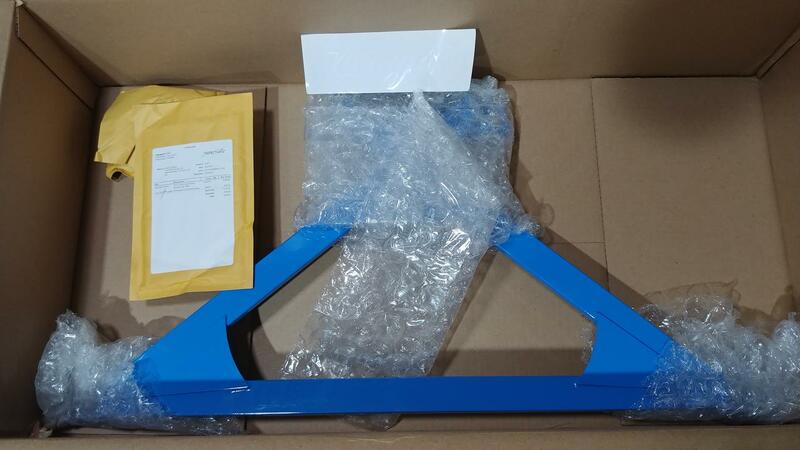 Came well packaged and none of the powdercoat was damaged. Seems like a VERY quality piece. Installation, as others noted, can be a little fiddly. All the mounting points are slotted, but they are TIGHT. I had to use a jack at a couple points to get the bolt holes to line up enough to tighten with fingers at least 2 or 3 full turns. I've stripped out CAB lollipop mount holes before and while helicoiling is an option... I would like to avoid if possible. I did not use any of the included hardware. I re-used the factory stuff with no issues. The included hardware just seemed way too long, especially since I did not use the spacers. This should give you an idea of clearance. It sits low, but I've only hit it once on a speed bump. Mostly because I am still getting used to it being there. Gone over many speed bumps but the only problem children are the tall and short variety. And even those clear if I go slow enough to not compress the springs on the other side. The longer/wider ones seem to have no problem clearing. They clear my cheap ebay long tube headers easily so I have no negatives to report really. 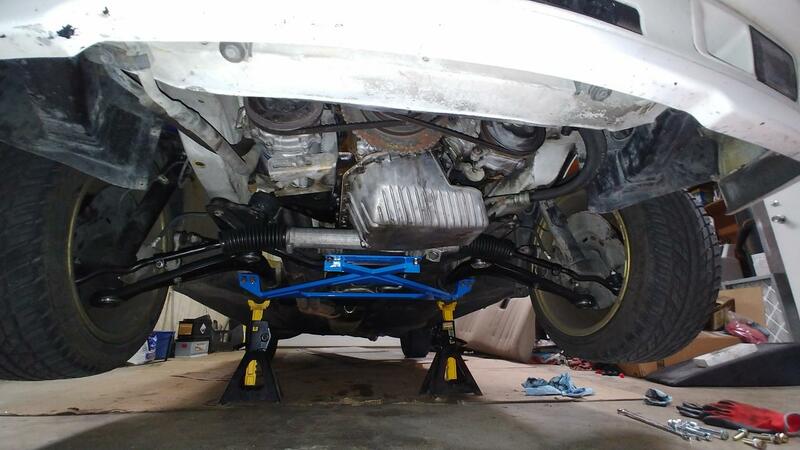 Extremely pleased with the purchase and really helped with the chassis flex of the vert. As mentioned, much quieter now in terms of chassis movement and twist. I am running on H&R sports with billy HD's and couldn't be happier. Will be purchasing their strut tower bar... and further in the future their reinforced subframe and maybe front sway bar. I have a question about these. Are the x brace hardware bolts long enough to go through the e36 rack spacers and bolt on the other end? Also... Since you have to take off the FCAB lollipops, dont you need to get an alignment after installing this? I would hate to do an alignment again after installing this - it costs 300+ for alignment on this eccectric bolt GC coilovered e30. ^I'm not sure why you would have to. The FCAB lollipops are not adjustable and the alignment sleeves on the chassis pretty much lock them into place. I did not get mine realigned. Yes the bolts will be long enough. 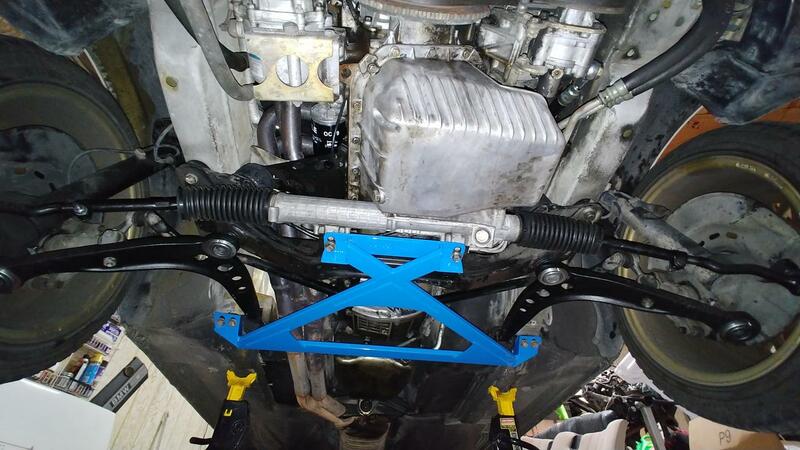 No because the front control arm bushings/ brackets are keyed, they only fit one way. Btw these are on sale for black friday. We still got a few left in stock in various colors. Red, blue, black and green.